Six nautical miles off the coast of Fripp Island, barracuda are prowling the deck of boat hull now resting 45 feet beneath the surface. With support from the Coastal Conservation Association South Carolina and the Building Conservation Trust, the S.C. Department of Natural Resources (DNR) deployed the 52-foot landing craft in an effort to build up the Fripp Island reef site, also known as PA-38. In addition to the boat hull itself, several sections of a steel radio tower were welded throughout the open deck in order to create a more complex habitat for the soon-to-be-resident fish. The Fripp Island Reef already contained several deck barges, armored personnel carriers from the Army National Guard and more than 200 concrete habitat modules. “The Coastal Conservation Association has been a tremendous help to us in getting high-quality material like this landing craft distributed all along our coast. 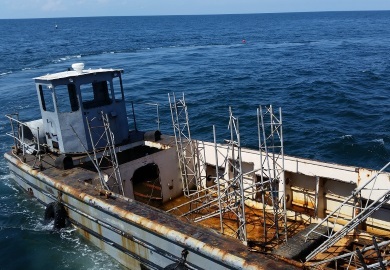 I have no doubt that this vessel, with the interior built up the way it is, will hold a great deal of fish in just a very short time,” said Robert Martore, artificial reef coordinator for DNR. Artificial reefs are man-made structures laid on the seafloor that provide a foundation for the establishment of productive habitat for marine life. They attract fish and other marine organisms from many levels of the food chain, and DNR has established dozens of artificial reefs off the coast of South Carolina to increase the amount of fish habitat and enhance recreational opportunities for saltwater anglers and sport divers. DNR constructs artificial reefs out of a variety of recycled steel and concrete materials. Structures like boat hulls are methodically stripped and cleaned before being sunk, leaving only empty steel hulls, in order to protect the surrounding marine environment. The Coastal Conservation Association South Carolina (CCA) funded the preparation of the recently deployed 52-foot vessel, and officials have named the new reef section the CCA-Fripp Island Reef. To learn more about DNR’s work on artificial reefs.